First, in my opinion they should do away with the below landing page where you have to select your country. Especially since this is the first thing a user sees when they visit hm.com, it is a pretty lackluster experience and boring/frustrating first impression. You just want to see the clothes! 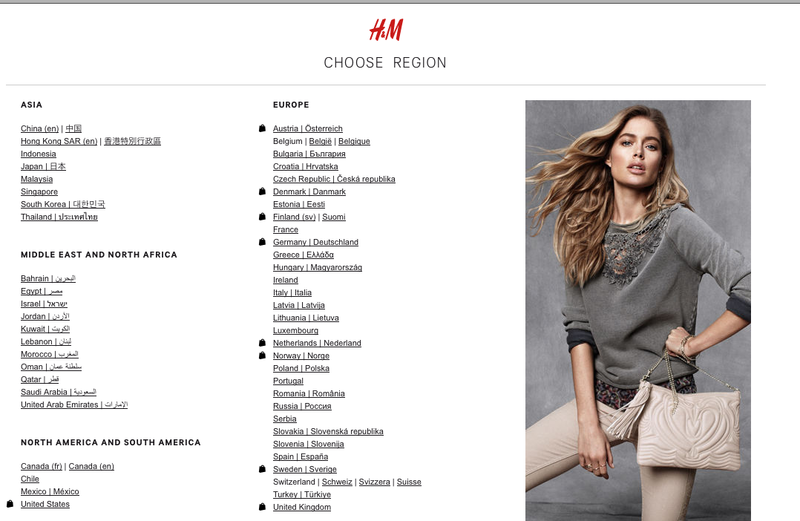 I think instead, H&M should simply use the IP address of the computer that is accessing the site to guess where the user is geographically shopping from. It won’t be 100% accurate, but they could probably eliminate an unnecessary step for the majority of shoppers. I was instantly drawn to the prominent “Sign Up & Get Free Shipping” offer. In exchange for providing your email address, you get a free shipping code — incredibly wise. 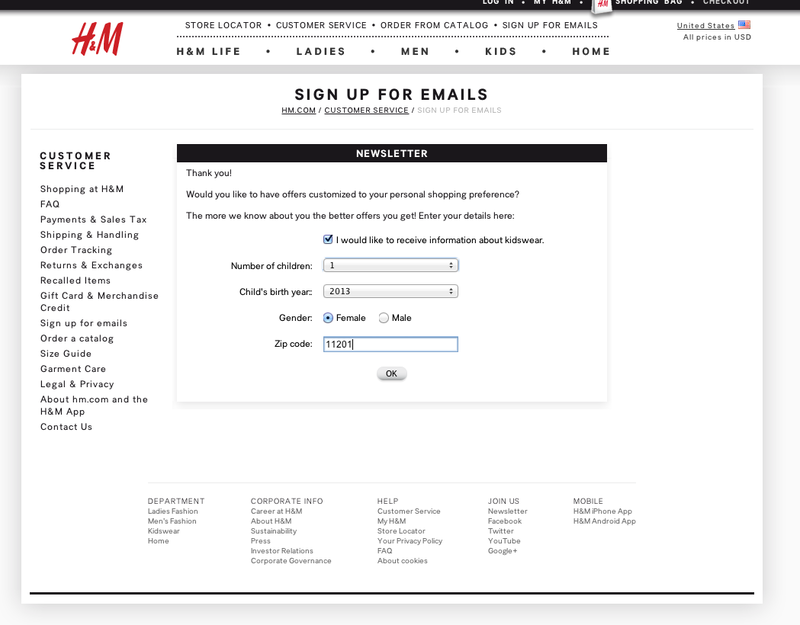 A primary goal for H&M at this point is probably building up their customer file so they can send regular communication. From the company perspective, it seems completely worthwhile to spend the $5.95 shipping fee as a customer acquisition cost, particularly because it really only costs them if the shopper makes a purchase. Many customers probably provide their email address but don’t purchase immediately. And as a user, it was an enticing offer too, as I felt that I could try out the site in a barrier-free way. I actually became very excited about this, because it had temporarily slipped my mind that H&M offers children’s clothing. My friend Marissa had told me this a few months back – specifically that they have adorable and affordable options and it’s her favorite place to shop for her son. So, when I was reminded of this offering, I was delighted and instantly went to check out the baby portion of the site. I’ll be using my free shipping code to make a few fall purchases for my son, Zach. 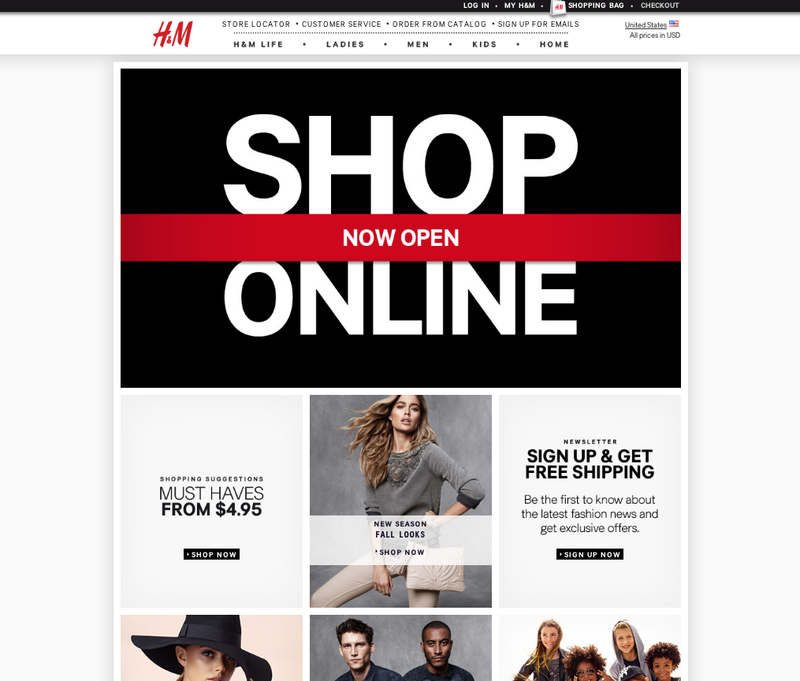 All in all, I am excited about H&M going online, especially because shopping their stores can often be a chaotic experience – long lines for the dressing rooms, too many items crowding the racks, and a messy store experience. But the merchandise itself can be good throwaway seasonal style, and I have a feeling they may get a good share of my wallet when it comes to kids.